When will the government shut all this freedom down? Mike Pompeo over the country’s activities in Latin America, urging the top US diplomat to watch his words. 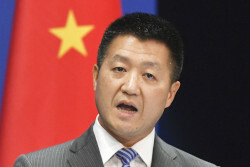 Ministry spokesman Lu Kang on Monday responded angrily to Pompeo’s remarks, saying he was spreading lies about China. Speaking during a four-nation tour of Latin America last week, Pompeo said Chinese financial intervention in Venezuela had “helped destroy” the country and called on leaders in the region to see who their “true friend” was. Lu, during a regular press briefing, said the US secretary of state had “wantonly slandered” China’s relations with Latin America. “For some time, some US politicians have been carrying the same version, the same script of slandering China all over the world, and fanning the flames and sowing discord everywhere,” Lu said.